Dream careers. Cross-country moves. Magical coffee shops. My clients have created lives more amazing than they ever thought possible. Their journeys involved tough roadblocks too. Doubt and fear making even small steps feel challenging. They moved past these by being kinder to themselves, worrying less and trusting their instincts more. In each of their stories shared here, there were moments of surprise and sheer delight when just what they were hoping for finally happened. Now it’s your turn. 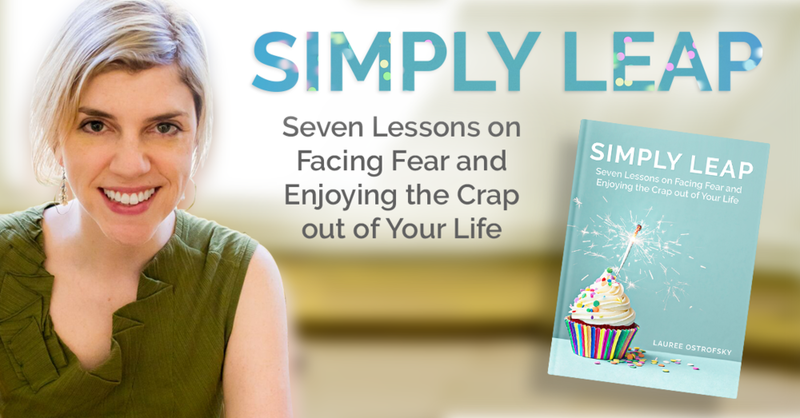 Through this behind-the-scenes look at leaps-in-process, you’ll learn the seven lessons you need to create a life you love and enjoy the crap out of getting there! This book is about reinvention - dreaming big and going after it - built by the brightest stars and most-successful clients in my ten years as a coach. Let their stories be the inspiration you need to finally leap after everything you want. That was the day I came face-to-face with the little white blob, an acoustic neuroma brain tumor. As it stared back at me on the MRI film in its golf ball-sized blobbiness, it was all I could do to stare back. That day also began a journey to see what was really happening in my life, and do something about it. This memoir is about the choices you make when you feel like you don’t have any. Once I met the blob, a series of scary moments and missteps followed – multiple surgeries and meningitis, leaving my cushy corporate job and safe marriage, a less-than-triumphant move home to live with my dad. It ultimately led to one of my best choices, creating the #HugTour Movement where I plot routes to office buildings and coffee shops to show loved ones how much I care. I learned that running hugs in traffic are exhilarating, and when you unabashedly share love, you receive more than you can imagine in return. Let this book be a comfort in the moments when you wonder if you’re doing the right thing, and a celebration for when your biggest dreams start coming true. They will. Mine did. I hope this story finds you when you, or someone you love, need to hear it the most. “With heart-tugging prose Lauree Ostrofsky offers a most engrossing tale of illness, recovery and self-renewal. Read this book. It will change your life."